What do ya all look like? Re: What do ya all look like? Ok, everybody. So far, who is the most handsome male member and the prettiest female member. This means we exclude the dog. This would be me looking a little dazed...I think it was at my in-laws. I get that look a lot there. I'm beginning to see that for the most part, sculptors are a handsome lot. Can't choose one and wouldn't want to anyway cuz that's only a matter of personal taste and each one has either character (which sometimes means not so attractive but interesting looking ) or beauty in their own way. Glad to see so many faces to put with the name and online personality. It's fun to see Steve M. We've cooresponded several times and now I know who you are! And no need for Pepto! And it was great to see the pic of Blake too - thanks for coming out of anonymity. A handsome group we have for sure. P.S. I think this topic really is helpful to bonding our relationships and growing as an artist, which is, in my experience, catapulted by good artist friends. Oh... and Jason popped in a pic as I was posting this. Thanks for posting- I particularly enjoy your posts because they are so well worded and poignant to whatever topic is at hand. Last edited by HappySculpting : 08-30-2006 at 12:56 PM. Hey -You guys and gals all Look Great! What a handsome bunch. Some surprises too – could have sworn Scout was a guy before the photo and JAZ a girl. Mark those photos are brochure quality. 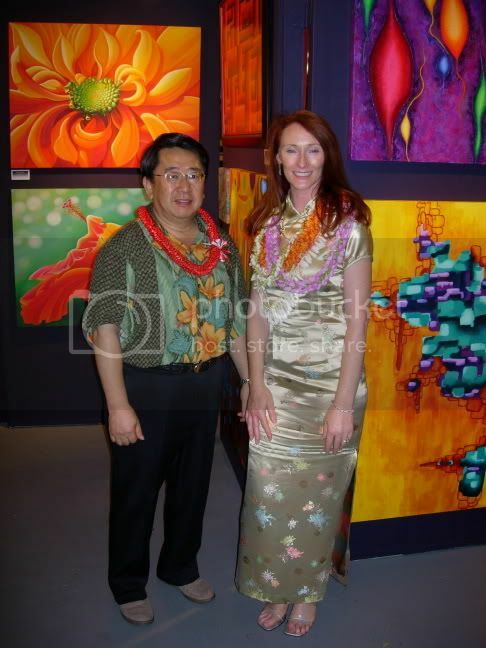 Don’t have a good working photograph, but here’s one of me with my Hawaiian inspired work at an opening in Honolulu Hawaii. It's amazing what artistic changes a few months and another culture can cause. Couldn't tell under the safety glasses and gloves. Upon second look the hair was a clue though. Hi Mountainsong, YES, Love your photo. Whose paintings are those behind that beautiful woman in the photo? The photo was taken at the end of the evening around midnight to 1 in the morning, maybe 600 people came through, we were really beat. This show was maybe six months ago? I’ve been in Korea 5 months now. Story of my life, build my presense up on the art scene, just start getting known and collected, then get wisked off to some other land only to have to start completely over again. Hi Mountainsong, The paintings look interesting, they have a sculptural feel to them, but I wish I could see more of them and the rest of the show, in its entirety. I agree. Keep them coming. On the other hand Tamara, your Avitar is too small and a bit dark. We still have not seen you sculpting. Don't need to be in the buff you know. Last edited by desertrock : 08-31-2006 at 03:13 PM. I like the vibrancy of your painting's colors and especially like the abstracted one to your left. It has a nice otherworldy feel about it. Beautiful dress too..I think we could all use some Asian clothing here in Tommy Hilfiger's America. Well, since mountainsong thought I was a guy, here are images to clarify that I'm not. First, what other people see. Second, with Potential cubed x 3, my eight foot maple seeds just to verify that, yes, I am actually not quite five feet tall. But I'm only small on the outside. Hey look at you Pretty Lady! You have such an engaging and friendly face. Thanks for posting face shots! Used to love those pod seeds as a kid, so fun to play with. DesertRock you totally look like a desert guy. Cool. Jsimms – that’s a great photo and that piece you’re working on looks marvelous. Jason, Hawaii and S.Korea are both more formal societies where the women and men dress up when leaving the house. I gotta tell you I appreciate it being a visual creature. S.Korea even more so than Hawaii. Here it’s dresses and heels for the women and suits and ties for the guys. The women even have sun parasols. I like what you said about "only being small on the outside." I've seen photos of your seed pods before, but I think it was in a landscape setting. They're more powerful with that white background and you standing there. Gives them a better sense of scale and assertiveness as forms in their own right. Gosh, everybody is so good looking in this Forum. Perhaps sculpture helps to rejuvenate us. I'm interested in JAZ's tall seed pods. They must be pretty heavy at the bottom to keep them stable standing on their small baseplates. And do you allow them to rotate with the wind, like wind vanes? OK, I'll play along. Merlion, I think you are right there that sculpting keeps us all pretty young and fit. Not a bad looking bunch. Here I am almost 50 and not a gray hair in sight...yet. Anyway, typical mug shot here - never can be serious when the lenses come out. The question I have is how much can you read into a photo? Everyone feels strongly that they know something about the person from the photo. When I meet people their reaction to what I wear affects/distorts their perception. If I'm wearing all black they think I must be an artist. If I wear something slightly more conservative I must be a professor, perhaps engineering. If I wear nice wool shirts I must be a contractor/builder. In a tropical/Hawaiian shirt I've been a real estate person/ or lawyer . So since I'm writing on this forum I must be a sculptor. Maybe I have multiple personalities(LOL)? Here is another photo--maybe I'm not as intelligent as most think?? I really am loving seeing the pics of people working on their projects. It's kind of like "show and tell"- "this is what I'm making and, see, here I am." One of my most enjoyable parts of the day in second grade. Seriously, though, it's a way of really connecting and learning what specific type of sculpture that you do. JOe- you still look smart- it's the glasses. Now if you take those off.... it might be disastrous! P.S. Merlion- a pic is coming... I first have to take one of me sculpting as I only have a few of me sculpting a long time ago (non digital photos) with a respirator mask on to protect me from the clay dust. Ok, ok, this is really me. The other picture was my human thrall who I control through telepathy....he supplies the opposable thumbs that nature cruelly denied me. But I will have the last laugh and be the first dog sculptor in the history books! Cuuute! ... and another vertically challenged sculptor!